The Tutima has a later dial on it (typical for factory serviced pieces) but i intend to send it over to the factory for a complete refurbishment (along with an original early dial that i managed to source...). 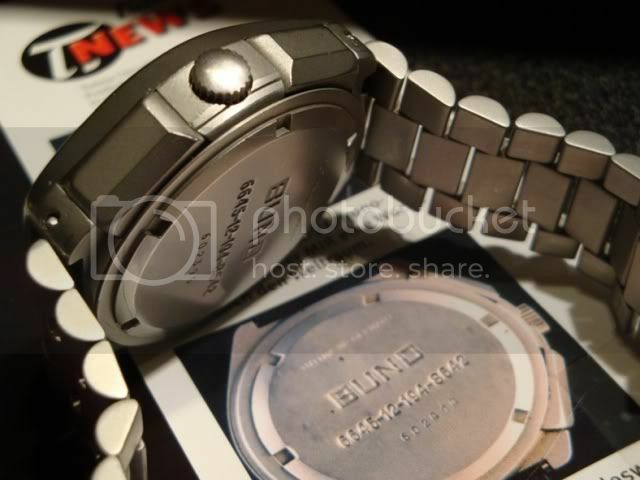 The watch came without bracelet on a 'EULIT' Bund strap, no box or papers. Serial number on this piece is very close to the watch that Klaus Flade wore on the Soyuz TM-14 MIR mission of March 1992. 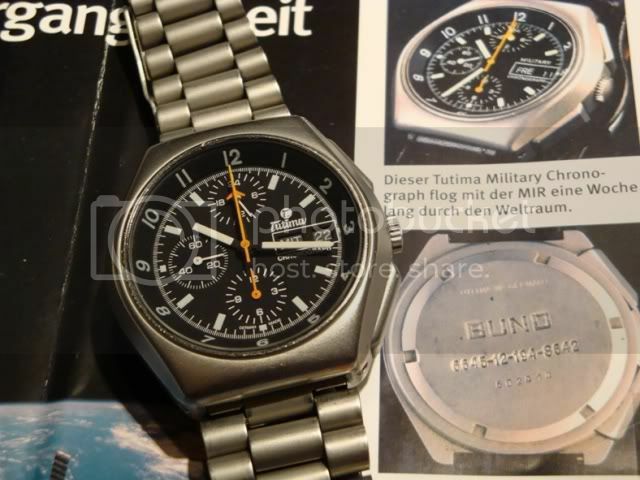 The Orfina/PD Black PVD 'BUND' is a 'double NSN' example (the -8642 NSN replaced the -1763 right after the Arctos BUNDs started being issued around 1982) which probably spent most of its combat time gathering dust in a 'Bundeswehr' warehouse. It came complete with box, papers and an unused Bund strap. Great watches. Thanks for sharing! Last edited by Pascal S; 06-04-2010 at 23:04.
at last the time has come to meet you (in the virtual world at least)! Needless to say that i have a photo of your collection in my screen (ruthlessly stolen from the net of course) which i look at every night while thinking ''Maybe one day..."
By the way did you see the LMC with the same case that went off on Ebay? I'm not that hard to find, though I've not been very active on watch fora lately. I've been hard-hit by the economic downturn, and I'm more into downsizing than anything else as far as my collection is concerned. A pity, but there are some treasures that nobody will be able to pry off my fingers! I am adamant in not selling my pieces as well! It appears that the guy somehow got himself a lot of Lemania parts and decided to ''resume production'' somewhere in the dark basement of his Medieval castle!!! Like the Old-style Tutima, very cool. However, I would like to ask a bit more about the Flade connection (I am writing another post on this topic). 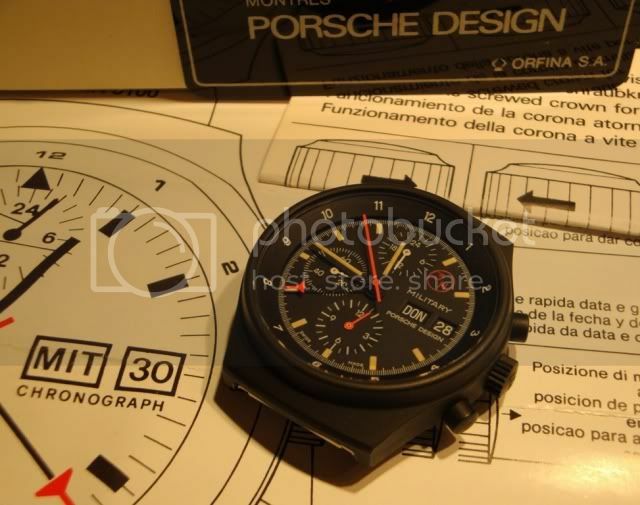 I have seen an auction listing from Flade's crew-mate (Viktorenko) claiming that he wore his Tutima on board Mir, but photographs only show his other watch, a Sinn, when in space. Have you got a bit more corroborative information (other than the auction provenance listing published in a Japanese language military watches book). Your photos are above a magazine - a few more details from the article would be very cool. Hi Dave and thanks for a warm welcome! The magazine pictured is the Tutima magazine from February 2006 which has a full report on Flade's Tutima. 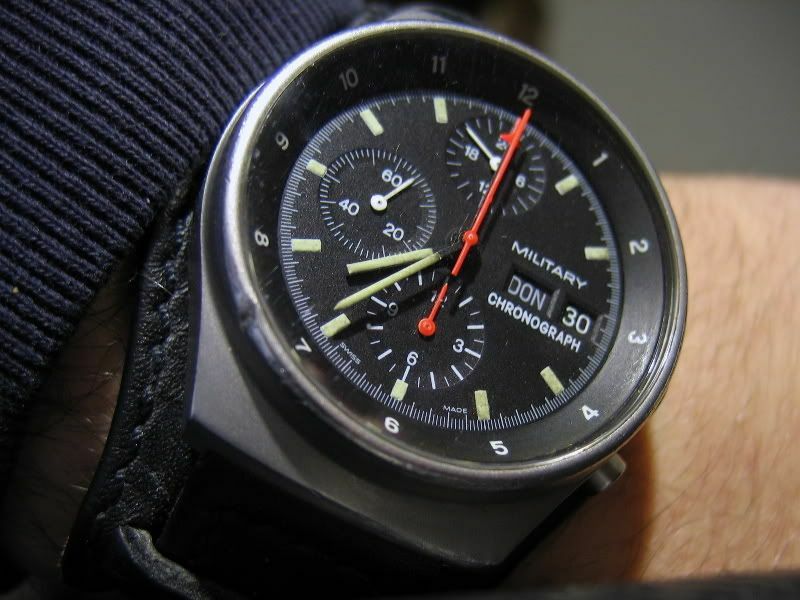 This watch with serial number 602414 was worn by Flade (don't forget that he was a Luftwaffe pilot so issued with a Tutima by the way) and on board the MIR it was exchanged with the watch that fellow cosmonaut Anatoly Artsebarsky wore. Artsebarsky later auctioned the watch (it bears his signature and the date 27.03.92 on its BUND strap) in the October 2001 'Space Memorabilia Auction' while verifying the above facts with a handwritten letter. 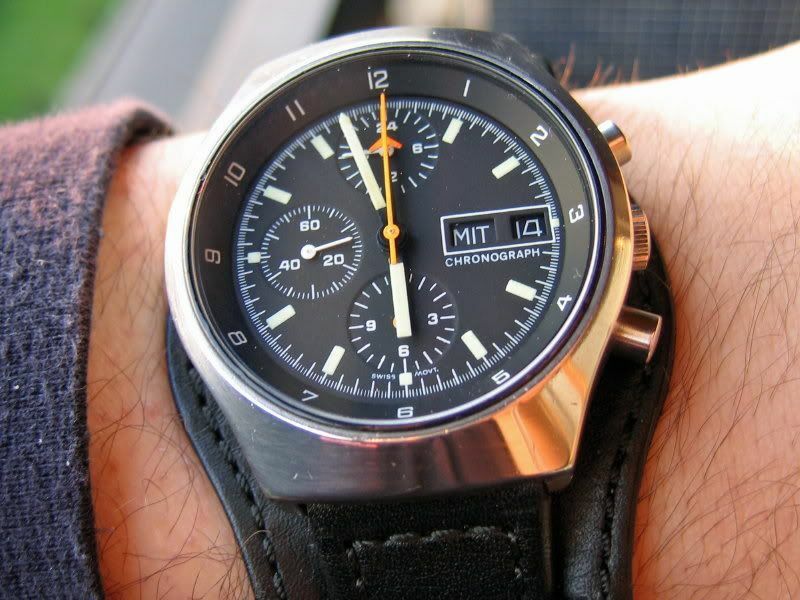 As far as the Sinn is concerned, this watch was most probably a 'sponsored' watch from Helmut Sinn as i have seen the 'post card' that Flade himself sent to Helmut Sinn to thank him for providing the watch. I had asked myself questions about that as well. 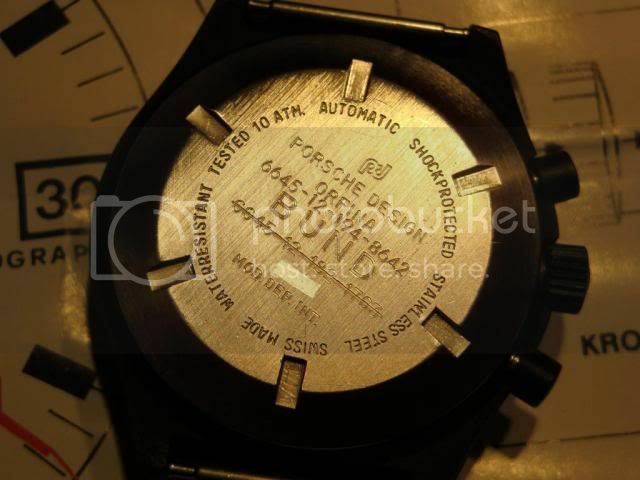 I have no doubt that the auctioned watch was Flade's issued chronograph. What I am wondering is whether the exchange really took place during the Mir flight, or if it happened at another point during training. Unless proven otherwise, I'm not fully convinced that Flade was allowed to carry two personal timepieces in space when weight is at such a premium. 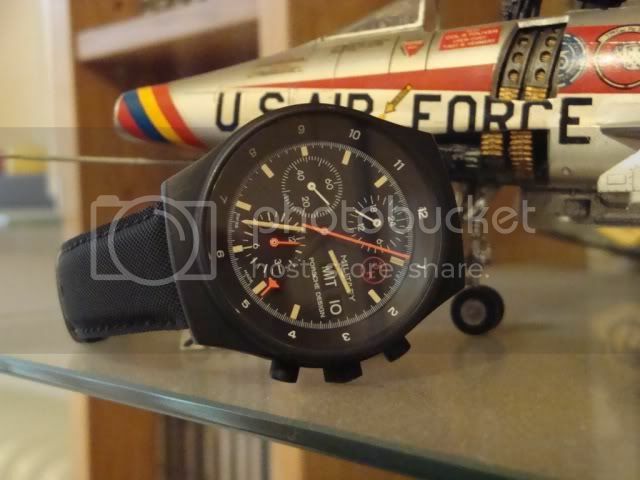 although weight is indeed a matter of great consideration regarding space missions, i wouldn't be surprised at all if Flade wore two watches as it is something rather frequent in space flights. I remind you of at least two such cases: David Scott in Apollo 15 (both his Speedie and Waltham with Valjoux 7736) and Jack Swigert in Apollo 13 (both Speedie and Rolex). And because Flade was a Luftwaffe fighter pilot himself, it is rather more possible in my humble opinion that he had the Tutima as his normal ('issued') timepiece and the Sinn as the sponsored one. Most photos that i've seen myself do highlight on the Sinn but let's not forget the publicity which was generated after this mission and was finally put in good use by Sinn itself.